Hi guys! Long time no see! My absence was caused by my crappy laptop's decision to call it a day. My hard drive completely froze and never really recovered, so all of my pre-made swatches are gone, down the drain :-(. Luckily I do have this one for you today: Vampira polish by Eyeko. Eyeko has just released five new trendy shades including a taupe, pastel pink, coral and this black and red glitter polish. The packaging is very cool. Every shade has their own designed label, absolutely adorable. 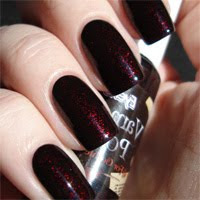 Vampira Polish (for gothic nails) is the star of the collection, hands down. I *love* this black base filled with bright red glitter. I think it's pretty hot, I could totally picture Elena from The Vampire Diaries wearing this. Not Bella though: "I've been tortured, Alice painted my toenails!". Aaaanyway, Eyeko sure knows how to please a vampire infatuated girl like me. The application was alright, definitely the best out of all the Eyeko polishes I've tried so far. It only needs 2 coats for complete opacity. It is a bit on the thick side though, so I would recommend adding some thinner for easier application. The finish is rather dull as well, you'll absolutely need a top coat to make it lust-worthy glossy. Eyeko polishes cost £3.50 (€4.- or $5.40) for 8.5ml, which I don't find to be that cheap actually. However, for a unique color like this I wouldn't mind making an exception. On the other hand: their shipping is extremely cheap: either free (if you're in the UK or Europe) or $5.40 for all international orders. This was it for today, thanks for reading and have a great weekend! EDIT: I compared this polish with China Glaze - Lubu Heels (14ml for $2.99) this weekend, and they're are really similar, the glitter in Vampira Polish is brighter though.